Compact Single Phase Smart Power Meter, 4 loops, Ethernet connection, ModbusTCP protocol. 60A CT's. Compact Single Phase Smart Power Meter, 4 loops, ModbusRTU protocol. 100A CT's. Compact Single Phase Smart Power Meter, 4 loops, Ethernet connection, ModbusTCP protocol. 100A CT's. 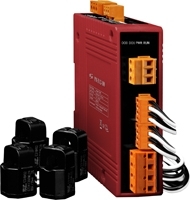 Compact Single Phase Smart Power Meter, 4 loops, ModbusRTU protocol. 200A CT's.